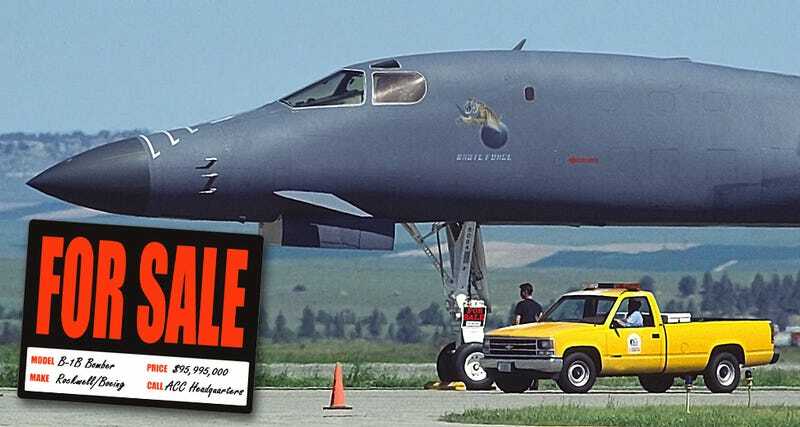 Here is the story about a B-1B bomber and practical joke involving a hardware store 'for sale' sign and great timing. It would have gone down in the annals of unsubstantiated aviation lore if it were not for a news reporter from the local paper and a long lens equipped camera. Some 14 years ago a B-1 bomber was in Billings, MT, doing practice instrument approaches and touch and goes. On one of the landings the pilot sets his brakes on fire. He then taxis in, and the airport parks him on a taxiway and then puts orange traffic cones around him until parts and mechanics can be brought in from Ellsworth AFB the next day. The next day is a Saturday, which doesn't have much going on, so we get to laughing in the tower that maybe somebody should hang a For Sale sign on the stricken bomber. We convince one of our guys who's well known for doing things like this that it would be a great idea. So he takes off for the hardware store to buy a 'For Sale' sign. On the way back he stops at a car dealer and gets one of those "As is/No Warranty" signs that hang in all used cars. On that sign was written something like: 'low miles, new engines, needs brakes and tires.' Those signs were taped together, and off goes our hero on his mission of glory. He climbs over the fence, leaving some skin on the barbed wire, and makes his way the 1000 feet or so to the aircraft. As he's doing that, we see a couple of airport vehicles starting to gather with the recently arrived mechanics as well as the plane's crew. Not looking good for our intrepid airplane salesman. He gets to the nose wheel and tapes the sign to the nose strut. Then he starts to make his way back from the plane as the vehicles start to head out from the shop on the way to the bomber. Somehow he makes it out without being seen. The vehicles arrive at the plane, and of course notice the sign right away. The Air Force guys are in stitches, funniest thing they've seen in a long time. Airport guys are not sure what to think. Airport management is livid as they've been tasked with security. Pretty soon a camera appears and all the Air Force guys are taking pictures of each other by the sign. Our hero is back in the tower now, and notices the bomber's commander is talking on a cell phone. Our guy gets on the radio to the airport truck and asks for that guy's phone number. As soon as he finishes that call, our guy calls the aircraft commander. When he answers, our guy says "I'm calling about the plane you have for sale." Aircraft commander about falls over from the laughter. It just so happened that the chief photographer for our local newspaper is a pilot and he may have been called prior to the sign being placed. He was told to get up here with a big lens. Here's one of the pics he got (posted at the top of this story). An article showed on the front page of the Sunday paper. When that came out, the Colonel running Ellsworth called the airport director and read him the riot act, wondering what kind of dog and pony show he was running up there. We were later informed by the crew that the sign was framed and is now permanently mounted inside the aircraft. Hard to have that kind of fun anymore.